Be careful! they be lurkin'! You alright? This cave is dark, and you know how they like to pull tricks on spelunkers and such. They don't mean any harm, but I'd pay attention if I were in you. Anyway! 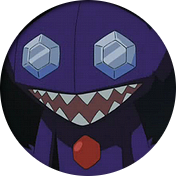 Welcome to Lithovore, a fansite dedicated to that trickster of a Pokémon that is Sableye. We have pages of content about the many ways in which Sableye is awesome, pictures, screencaps and even some fan art! Feel free to have a look around...and mind your step. January 22, 2013: the site is still archived, but I added some new information on the origin page. Sableye and Pokémon are copyright 1995-2015 Nintendo/Creatures Inc./GAME FREAK Inc.; no copyright infringiment intended.